War on Animals is an introduction to the animal rights and welfare issues. For animal testing issues, see also animal testing. For animal issues relating to U.S. government subsidies, funding, inspections, animal testing requirements and military testing, see also U.S. Government's War on Animals. For farm animal issues in relation to human health and the environment, see also meat & dairy industry. 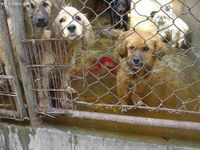 For commercial dog breeding, see also puppy mills. For humane groups, protests, boycotts and general observance days and weeks, see also Humane Movement. 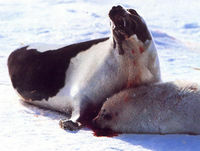 For U.S. legislation, see also U.S. animal rights legislation. See also animals raised & hunted for food. Dec. 2006, HSUS investigation: Horse slaughter cruelty uncovered. In a shameless bid for public damage control, the company actually prohibited contract PMU ranchers from working with rescue groups. The rationale being that these abused, neglected horses, who along with their foals, are destined for slaughter; do not need to be rescued. See also Premarin. Footage of beating and other primate abuse in entertainment industry. Dec. 2007: Mercy for Animals anti-fur protest in Chicago. Leg hold traps have been banned in 88 countries. In spite of irrefutable evidence of cruelty, mutilation and dangers to non-target animals and children; they have only been banned in 8 states. 74% of Americans oppose the leg hold trap, yet Congress has not banned them thanks to the fur industry and lobbies like the American Veterinary Medical Association (AVMA). In a public relations motivated move, the industry began manufacturing traps with a rubber strip across the jaws. However, these traps still close with the same force. In the up to 3 days it may take for a trapper to return, an animal may suffer or die of dehydration, blood loss, hypothermia, trap inflicted injuries or predators. A 1995 study of coyotes trapped in padded leg hold traps found that 97% experienced severe leg swelling and 26% lacerations and fractures. A study of 55 red foxes found that 25 suffered severe swelling; 23 severe lacerations; 17 fractured their teeth and 13 suffered severed tendons, abrasions or fractures. "Drowning sets" are designed to kill beaver, muskrat and mink. Animals in these traps struggle for an average of 9 1/2 minutes and a beaver may hold out as long as 20 minutes. See also AVMA, section 1. Australia's 100 million sheep produce 30% of the world's wool. Holdings consist of thousands of sheep so that individual attention (even to medical emergencies) is impossible. Merinos are bred to have wrinkly skin to produce more wool This unnatural condition may cause sheep to collapse or die of heat exhaustion. Wrinkles also collect urine and moisture. Flies lay eggs in the folds of the sheep's skin and hatched maggots can eat the sheep alive. To prevent "flystrike", ranchers perform "mulesing", a barbaric procedure which forces a sheep on its back, restrains legs between metal bars and slices hunks of flesh from the tail area. Museling is performed with out painkillers, the purpose ostensibly being to produce a scar which cannot harbor eggs. However, exposed wounds often get flystrike also. Constant chaining tends to coincide with sporadic feedings, over exposure and other neglect. It is in itself, psychological and physical abuse. A dog chained to one spot for hours, days, months or even years becomes neurotic, unhappy, anxious and often aggressive. In some cases, a dogs neck becomes raw from improperly fitted collars and constant straining to escape. Dogs have even been found with collars embedded in their necks from years of chaining. Chained dogs make easy targets for other animals, humans and biting insects. They may also be stolen and sold for animal testing or used as training fodder for dog fighting rings. A dog's tether may become entangled and strangle him to death. See also U.S. Global Exotics. This page was last edited on 11 December 2015, at 15:44.